In the part 1 we created the data storage for user data, the user crawler and the mini Node server. Today I'll show you the map that fetches the data, lookup and saves the location and finally show them on the map. It uses the same collection of the open db instance, fetches all the stored records and makes a JSON output. Later that will be called from the map page. I think it's more re-usable than generating it into the page content. There we lookup the item - if it exists we update, or die in trauma otherwise. It reads the file and toss it to the broadband. That's all we need. Let's make the page then. 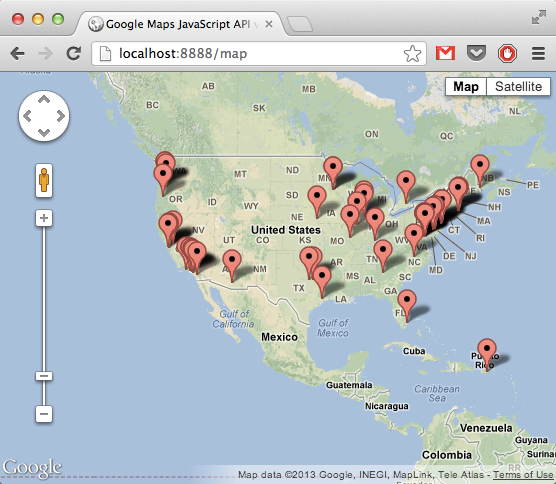 Wireframe is almost by the book - we have the Google Maps API and some jQuery support. The style is a little trick we want to apply - it makes possible to stretch the map out to the full screen estate. The original code has some extras, such as basic error handling. You can find the source in my OkCMap GitHub repo. I'm aware that this is not the best way to solve the problem. I might missed modules in NodeJS to solve sub-problems. If you know a better way, please, share.